Statistical analysis is a useful skill for linguists and psycholinguists, allowing them to understand the quantitative structure of their data. This textbook provides a straightforward introduction to the statistical analysis of language. 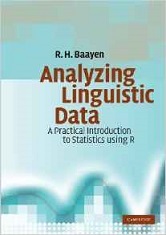 Designed for linguists with a non-mathematical background, it clearly introduces the basic principles and methods of statistical analysis, using 'R', the leading computational statistics programme. The reader is guided step-by-step through a range of real data sets, allowing them to analyse acoustic data, construct grammatical trees for a variety of languages, quantify register variation in corpus linguistics, and measure experimental data using state-of-the-art models. The visualization of data plays a key role, both in the initial stages of data exploration and later on when the reader is encouraged to criticize various models. Containing over 40 exercises with model answers, this book will be welcomed by all linguists wishing to learn more about working with and presenting quantitative data. A straightforward introduction to the statistical analysis of language, designed for those with a non-mathematical background. Using the leading statistics programme 'R', the reader is guided step-by-step through a range of data sets, aided by over 40 exercises with model answers. Suitable for all those working with quantitative language data. R. H. Baayen is Professor of Quantitative Linguistics at Radboud University of Nijmegen and the Max Planck Institute for Psycholinguistics, Nijmegen.